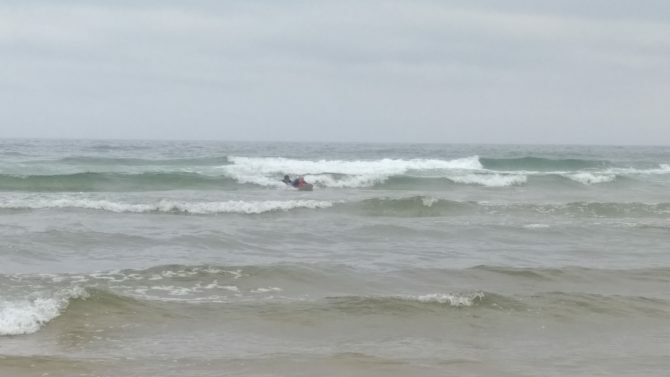 My mother’s always been afraid of the water — a fear created by stories of drownings on the banks of the Uruguay River that divides the states of Santa Catarina and Rio Grande do Sul in Brazil. Maybe if she were growing up there now she wouldn’t have this trauma. Part of the city of Marcelino Ramos and its magnificent canyon was submerged because of the construction of a hydroelectric plant and dam. The canyon was called Estreito Augusto César and its grandeur was overshadowed by “progress” in the year 2000. And with this, the river was transformed into a large lake, completely altering the landscape. But the fear in my mother persists to this day. Surprisingly, she saw a video of 80 and 78-year-old surfers and found it funny when one of them said she felt she was the “owner of the world” when standing on a board. I hesitated when she asked about the possibility of trying for herself. After all, there are risks involved and at 75 years old, I would feel responsible if anything were to happen to her. However, being a surf instructor, I couldn’t deny the request and I began to work out a plan with the surf school staff. When we looked at the forecasts, we realized that there would be a window of three days of small waves. Along with my father, my mother has gotten stronger and gained the courage to face the challenge. My father is 77 years old and even though he has his own health problems, he is usually up for anything, from traveling to going out at night or even hiking. Married for 51 years now, the two have a lot of energy and walk an average of five kilometers a day. They like to say that they are like swallows, migrating to another hemisphere in search of pleasant climates with an adventurous spirit that grows stronger and stronger. It’s admirable to see them stay so active and a good reminder that age really is nothing more than a number. I had a mixture of feelings reading this. On the one hand, I felt a certain relief and on the other a disappointment. I decided not to give up, though. I reminded her of her abilities and also that the risks would be minimized. What was first a self-imposed challenge perhaps for her was more like a proof of love to her son. She wanted very much to enter my world and satisfy her curiosity about my attraction to the sea since I was little. The day finally came. We went to Praia das Maçãs at 8 a.m. with a weak rain and she said, “Well, it’s not cold and there’s no wind.” When she took my hand to take a step toward the unknown, she showed total surrender and confidence. Our parents are often superheroes and although they eventually lose some of their superpowers, they are incredible at gaining others along the way. Advances in medicine don’t guarantee quality of life. To know how to grow old is to accept this phase and its limitations, to maintain curiosity and enthusiasm, to add knowledge and wisdom without ceasing to learn. Above all else, it is to keep the spirit young over the years. But you have done so much, my darling. Especially in a time where we see the exclusion of the elderly from society and more and more we forget to live our own new experiences. On this one day, I had the opportunity to be my mother’s teacher. But once again, it was her teaching me.